Reliability and strength is the order of the day with the Hino 300 Bus series. The Hino bus has been built to function primarily as medium sized carrier bus that is ideal for any transportation company that wishes to extend its bus fleet to accommodate more routes or more travel destinations. If you are looking for a bus for sale, the Hino 300 series is a good option. The bottom line economics of using the Hino 300 bus are substantially lower than that of most buses in the market. The Hino’s low fuel consumption ensures that you will spend less per person transported on this bus than you would in other buses. 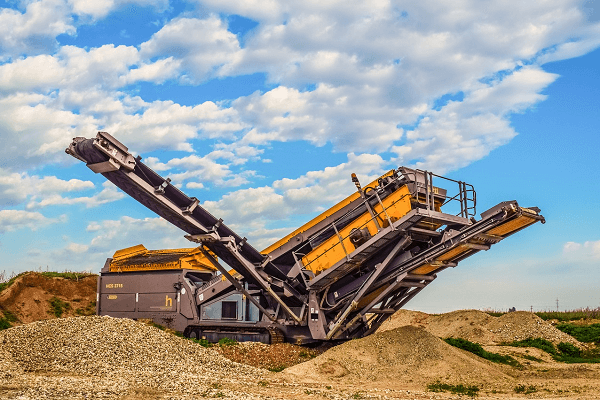 Image Source: Hino South Africa Website. 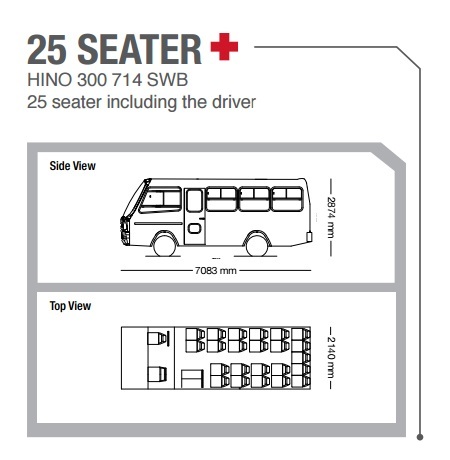 The Hino Bus comes in three models varying in size and carriage capacity. You have the option between the 25 seater bus, the 33 seater bus and the 35 seater bus. All of these options come built with a lot of features that will certainly put this bus on the top of your to buy list this year. As mentioned in the previous paragraph the new Hino 300 comes built with numerous interesting features. 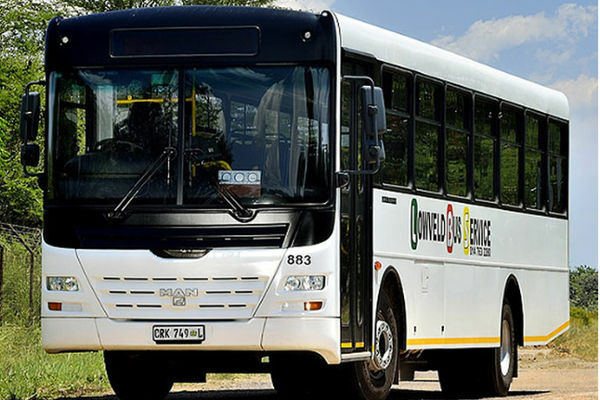 Hino has taken action to ensure that disabled passengers are taken care of. 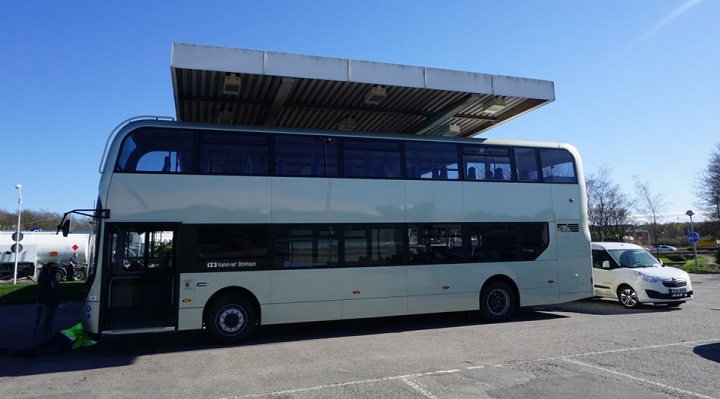 For the disabled Hino has built a wheelchair access ramp that is powered by a hydraulic lift to ensure that everyone including those who cannot walk can easily get into and out of the bus. The Hino also gives you the flexibility to choose the ramp layout that matches your specific needs. You will have the option between multiple ramps for different wheelchairs. There are other optional features which you can get on request. These features include; GRP interior with LED strip lights, luggage lockers, a towbar and plug, curtains, saloon heaters, a PA system and fire extinguishers to put out any fires in your bus. Image Source: Hino South Africa Website / Model Brochure. In the market for a Hino Bus for sale? Create your Hino Bus Alert and get information on all the latest Hino buses listed on Truck and Trailer. 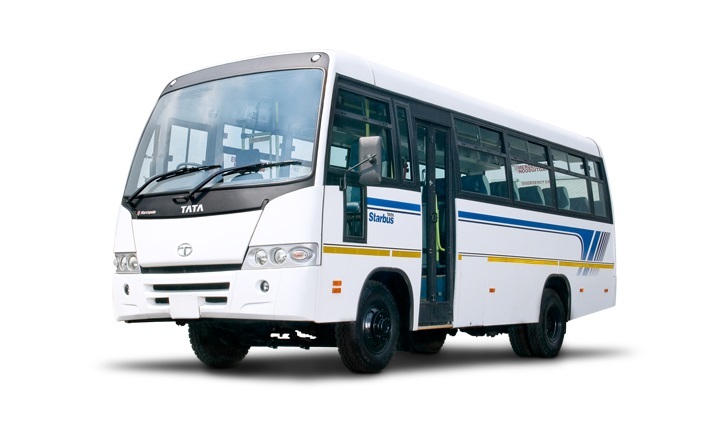 As mentioned, the Hino 300 series comes in 3 models; the Hino 300 714 SWB – a 25 seater bus, the Hino 300 815 LWB Auto – a 33 seater bus and a Hino 300 915 LWB which is a 35 seater bus. Aside from carriage capacity, size and price, all models have very similar standard specifications. You can generally expect to see an exterior that has been painted with Durathane K and finished off with a Durathane K enamel coating. The exterior of this Hino bus has also been coated with an extra layer of protection to reduce the accumulation of rust and corrosion. The window openings have been fitted with a protective layer to reduce the amount of water getting into the vehicle. Again this has been done to reduce internal corrosion and rust. 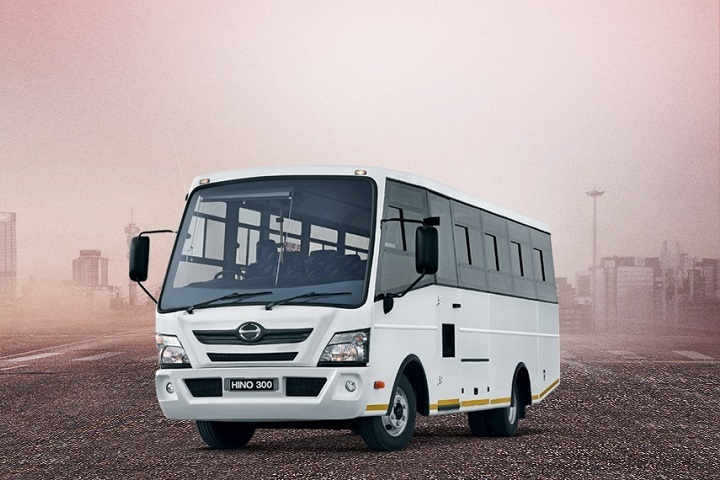 In terms of the body of the Hino 300 bus series the bus has been built using tubular steel construction and steel sheeting. This is a very strong material that guarantees the durability of the Hino bus body and simultaneously ensures that the body of the bus is compliant with the requirements of the “Compulsory Vehicle Standard” issued by the SABS. You can also expect to find standard features such as a mud flap on all wheels that acts as a protective barrier against mud accumulation on wheels, 2 number plate holders, an emergency exit roof hatch, a slam type passenger door on the wheelbase, driver door, windscreen wipers and a windscreen washer and a spare wheel carrier. 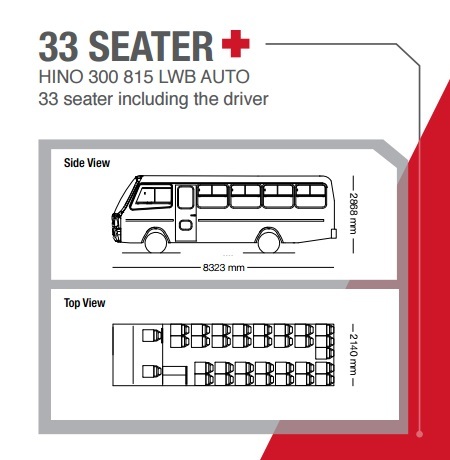 In the interior of this Hino bus for sale you will find a number of standard safety features to protect both the driver and the passengers. The bus comes built with lap belts on all its seats and a full length hand rail. The floor bus has also been covered with a flexible sheet that is PVC based. This has done in order to ensure that the floor does not become slippery in rainy conditions or if there is water on the floor of the bus. If you are looking for a bus for sale, create your Bus Alert and get information on the latest bus ads placed on Truck & Trailer. 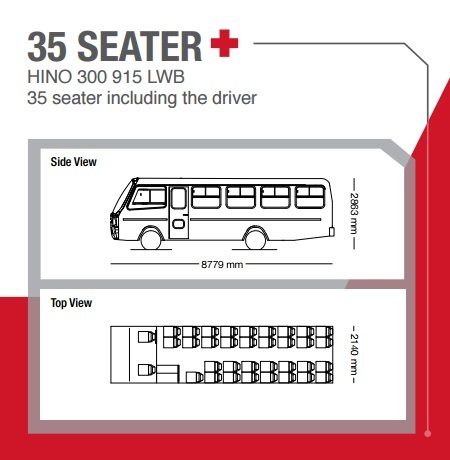 The dimensions of the Hino 300 bus series vary depending on the model you choose to purchase. With the Hino 300 714 SWB you can expect the vehicle to have a minimum ground clearance which will have a measurement of around 210 mm while the wheelbase will have a measurement of 1520 mm. The Hino 300 815 LWD Auto comes with a larger minimum ground clearance of 215 mm and a wheelbase size of 4200 mm. While the Hino 300 915 comes built with a lower minimum ground clearance of 200 mm and similarly to the Hino 300 815, a wheelbase of 4200 mm. If you are interested in making a solid investment, the Hino 300 bus series might be ideal. Start looking for the perfect bus for sale by visiting Truck & Trailer now. Next story Truck & Trailer is now on WhatsApp!